Patable water and sanitary facilities. 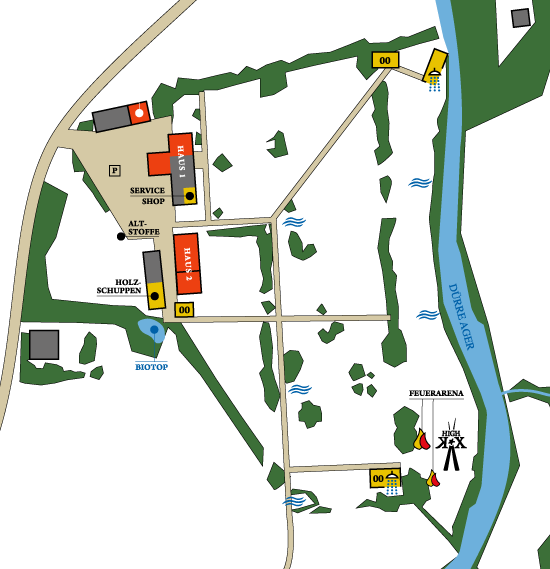 The Scout Camp Austria ist 50.000 m2 large. Although several are visiting, there is still enough space for sports, games and adventure. Large trees provide enough shadow on hot days. Drinking water you get at five waterholes and three modern sanitary buildings. One of them is equipped with showers. You can make campfire in the provided fire bowls or in the two fire arenas. Of course you can make camp buildings. The grass of the campsite is used as forage. We ask you in the end of your camp to clean your place thoroughly and remove wood, herrings and waste conscientiosly.